In a poll that’s as unscientific as it is informal, it looks like Logitech is the IT community’s preferred brand of computer keyboard. In a recent Spiceworks thread titled: “Are there still any good keyboards and mice to be bought nowadays,” 201 respondents chimed in with a reply, making it a surprisingly popular topic. 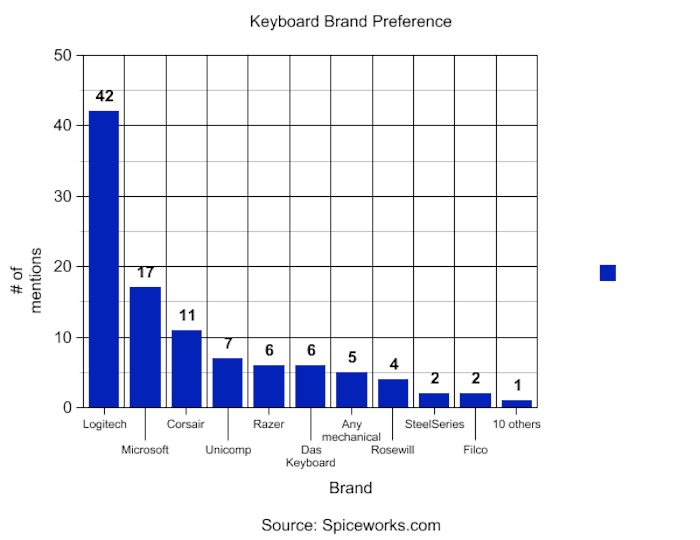 Logitech was mentioned by 42 commenters as their keyboard brand of choice—25 mentions ahead of second place, which went to Microsoft, with the Microsoft Natural series getting most of those mentions. Corsair came in third, with the K70 and Vengeance models accumulating several mentions apiece. Additionally, the thread’s first comment, a unanimous pledge for Logitech, was “spiced” 40 times (the equivalent to a Facebook “like”). Not every commenter mentioned a brand. An explicit mention of preference was needed for our count. Of the 201 commenters, 120 declared a clear preference. We were curious how Newegg users rated some of more popular models mentioned in the Spiceworks comments. The Logitech MK550 Wave combo mostly holds up to its mentions; out of 223 reviews, it received at least 4 out of 5 eggs 70 percent of the time. The key complaint is that the Bluetooth connection lags—something also noted in the Spiceworks thread. These issues possibly stem from a problem with RF radiation interfering at the 2.4 GHz frequency utilized by wireless keyboards and mice. Logitech addressed this issue in December 2012 on their support forum. Another specifically named model, the Microsoft Natural 4000, is also one of the most reviewed keyboards by Newegg users. Of the 892 users who logged a review, 511 gave it a maximum 5-egg rating and another 160 gave it 4 out of 5. 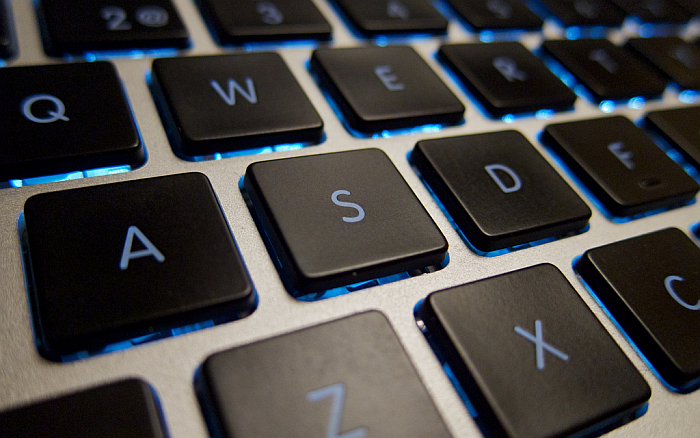 Users like the overall feel of this keyboard, which is designed with a curved arc meant to reduce carpel tunnel risk. The main gripes are that certain keys got stuck after a while, and a few users ran into problems with the keyboard shorting out. (Read: don’t eat and drink at your desk). A trend among users who care enough about keyboards to comment about them is that they recommend mechanical keyboards, which happened at least 31 times in the thread. A mechanical keyboard uses actual, physical switches underneath keys to determine when it is pushed down. This is different from a membrane keyboard, which is comprised of a set of three plastic membranes with rubber dome-shaped switches underneath each key. Press a key, and the rubber switch pushes through a hole in the middle membrane, creating an electrical current between the top and bottom membranes, which signals your PC to register this action. Membrane keyboards are cheap, spill resistant, and quieter—that is, there is no clack-clack-clack so typical in vintage-era word processing and data entry. Nothing says clacky keyboard quite like the legendary IBM Model M, which was mentioned at least six times on the thread. This beaut is the 1989 model. You can almost hear the spacebar in the image. As for myself, someone who spends upwards of 40 hours a week punching out copy on an OEM Dell model, I side with the six respondents who said the cheapest possible is their preferred route. I can’t remember ever “retiring” a workplace keyboard, or having the letters wear off. Then again, I tend not to eat at my desk and have been lucky with my omnipresent coffee cup. Knock on laminate. What computer keyboard are you using?